When you are playing a battle royale game like Survivio, it is always wise to keep some tricks up your sleeve. 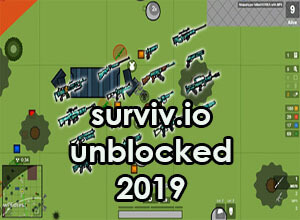 Check out the 5 best sneaky techniques for Survivio unblocked 2019. 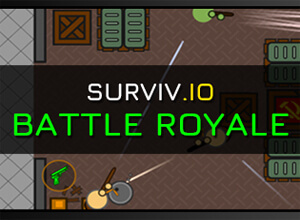 The 2d battle royale game, Surviv.io unblocked 2019 require you to survive till the very end in order to take the title of the champion. To earn the Chicken Dinner, a term used for the winner’s title, one needs to hone in their skills, techniques and strategies up to a perfect scale. While the knowledge of weapons, armors, and utility items come in handy, it is the how, when, where to use them, that makes all the difference. In a bid to help you with your skills, here are 5 extremely sneaky techniques for Surviv.io unblocked. While a very smart Survivio unblocked technique, it is only known or employed by very few. Extremely effective when you are chasing your opponent around an outhouse, a silo or a shipping container. Throw a Frag or MIRV Grenade into such spaces without cooking. While you continue to chase, push them into the grenade. Left with no options, the opponent will either try to run away or charge at you. In either of the scenarios you can easily target them for a kill. In case they don’t run the grenade will do its job of killing them. 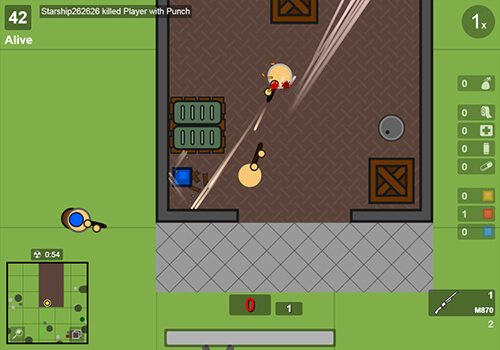 This particular technique is basically a glitch in the Surviv.io unblocked 2019 system. When you switch gun slots really fast, usually done by pressing “T”, each switch moves you a few pixels ahead. During a combat situation, this tactic can save your life by giving you extra momentum and speed. The best part of this Surviv.io unblocked hack is that it is known to very few, as you won’t be able to discover the glitch until you are intentionally looking for it. More than a technique, this is an important strategy for Survivio unblocked 2019. Keeping an eye out for your surrounding and using it to your benefits. For instance, when a opponent is standing next to an explosive objects, barrel or the control panel, shoot on the neighbouring object. The subsequent blast will deal massive damage to the enemy. Another sneaky trick to employ when you and your opponent is close to a metal objects such as ovens, containers, barrels, hedgehogs, silos or warehouse walls. These surfaces are known to reflect bullets, i.e. the bullet ricochets. A smarty planned ricochet could kill your opponent with ease. However, this is a techniques that needs much practise and attention as the resulting ricochet could harm you in equal measures. Many player underestimate the power of a good melee weapon in Survivio unblocked, especially when you collaborate them with smoke grenades. Gunning is not much useful when you and your opponent are covered in smoke, so swing around a melee weapon. It is bound to collide with your opponent at some point, considerably lowering their health. Well this is otherwise called as the last resort in Survivio unblocked universe. When you are about to die, why die alone; drop some Frag Grenades and take your opponent along with you. Surviv.iois one of the few games where having more than a few tricks up your sleeve is definitely an added skill. However, a bigger skill is to employ these techniques at the right place and right time. Now that we have shared some great Survivio unblocked 2019 techniques, go ahead and show them off.